Brockman Storage Trailers offers maintenance-free storage trailers for rent. If you have a specific need for a trailer but don’t want the hassle of maintenance or owning a truck to move it, let us create a custom package for you for a long-term rental. We have 53' storage trailers for rent as well as dry van trailers. When you need your trailer moved, call us and we’ll move it. We will handle all DOT requirements, if needed, to keep the trailer current. If you need a trailer that doesn’t need to be moved every day and is used primarily for storage, this is a great option. We can store the rental trailer that you’ve loaded with your goods. We also provide long-term storage lot rental for your trailers. For 53-foot trailer rental prices, or to talk to someone about your commercial storage needs, click here. Whether you are moving your business, remodeling your office, or just need some storage for a while, try a Brockman Drop Trailer. Our drop trailers are safe, secure, watertight, and nearly indestructible and come in 28-foot, 45-foot, 48-foot and 53-foot sizes. Brockman takes the stress out of moving as one of our friendly and professional drivers will drop off the trailer. You load it up at your own pace and schedule a time for us to bring it to the unloading address—usually the same driver will pick it up. Need it stored instead? We will be happy to store it at one of our many yards in the St. Paul area. If you need help with moving, transferring a load, or a regular haul of weekly or monthly freight, call Brockman Storage Trailers now. We’ll save you time and money and provide you with great service every time. Transfers are from one building to another, not one trailer to another, we don’t cross dock product. At Brockman Storage Trailers we have experience with just about every commercial storage need. Our dry, clean, well-maintained trailers can provide an economical, hassle-free answer to your storage needs. We offer 53-foot, 48-foot, 45-foot, and 28-foot drop trailers and even a few sizes in between. Our trailers can be loaded with a forklift and are dock height. Need something more out of your trailer rental? If your trailer is in a highly visible location we can work with you to create a custom decal design to go on your trailer to promote your company. Popular uses for our trailers are at manufacturing facilities where trailers can store spare raw materials or a shipment not ready to go out yet. It’s essentially a mini warehouse on wheels that can be loaded with a forklift when backed up to a loading dock! Our trailers are commonly used at retail spaces to handle extra inventory for peak season or as a space to store layaway items. Hospitals and schools often use our trailers for temporary overflow storage. 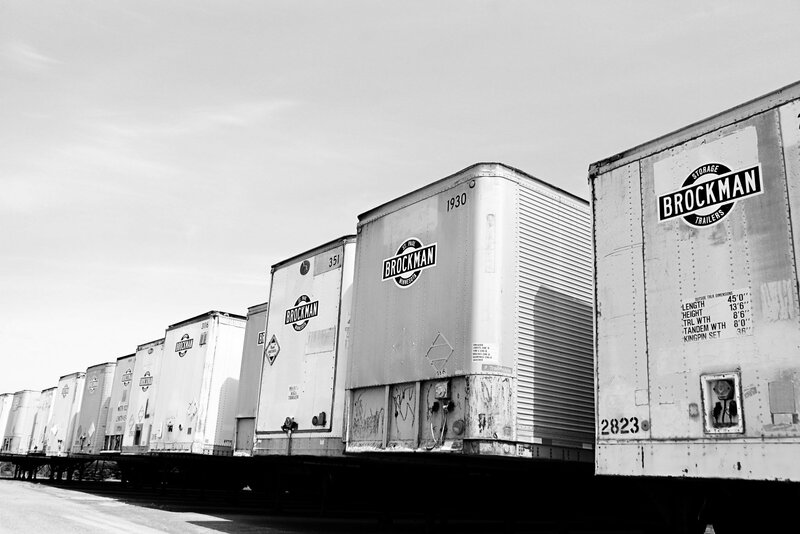 At Brockman we do long-term electric reefer rental. Please allow time to build the trailer. If you’ve got a long-term job coming up, why not have your trailer market for you? Long-term custom trailer rentals may be decaled with your logo or custom design to promote your company or product. Custom art makes a job site trailer for a construction crew look great and gets your brand out front and center. Trailers that are going to be parked for a long period in a highly visible area are also good candidates. Go beyond simple storage with a billboard trailer from Brockman Storage Trailers. *Credit card’s accepted with a 3% surcharge.